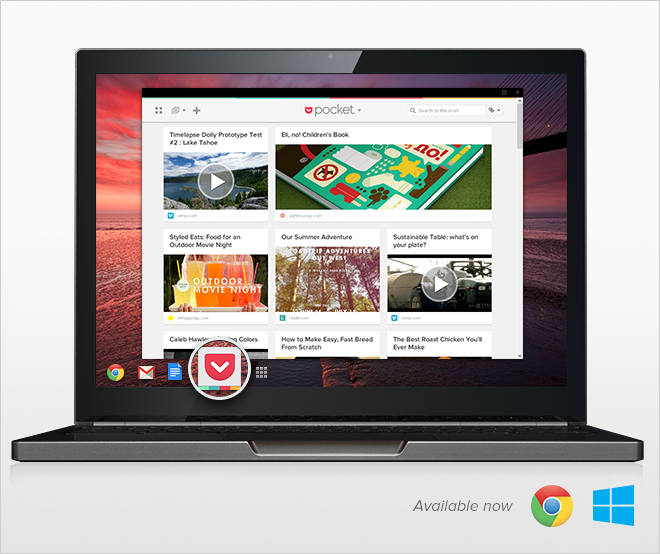 Pocket, the handy tool for saving stand-out content across the Web and then reading, watching or looking at it later on another device, has launched a new desktop app for Windows and Chrome OS users. The app is built on Google’s new Chrome Apps platform and offers a similar full-screen experience to that found on Pocket’s Mac incarnation. Articles saved from the Pocket Chrome extension (or any of its other apps, for that matter) will be saved automatically for offline viewing with the new Windows and Chrome OS apps. Upon launching the app and logging in to their existing account, users should therefore see all of their previously bookmarked content ready and waiting. That includes keyboard shortcuts and Pocket’s distraction-free user experience, optimized for desktops and Chromebooks alike.